Design for the Cisco 8961, 9951, 9971 IP phones and Nortel (Avaya) 1120E, 1140E, 1150E, 1165E phones. This cable allows users to answer and end calls up to 300 ft. away from their desks. The seamless integration of handset and headset allows users to benefit from enhanced mobility and the ability to multitask while on a call. Do not order this cable if your phone is not listed. * The Cisco server must be running Cisco CallManager System Version 4.1(3)SR5x or higher. This must be verified by your telephone administrator. * The Cisco phone must be running firmware 8.3(3)x or higher. 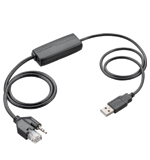 * Nortel firmware 3.1 has enabled USB support on Nortel 1120E and USB and Bluetooth support for 1140E and 1150E. The firmware revision needs to be at least rev 0624C6J (1120E), 0625C6J (1140E), 0627C6J (1150E) and up. The APU-72 EHS cable replaces the APU-70 & APU-71 cable and features compatibility with the Plantronics On-line Indicator accessory.